Can I limit how high my pledge gets? Yes you can! You can set a pledge cap on each goal. For example, if my pledge cap is $10, derailing at $10 will not raise my pledge to $30. It will remain at $10. 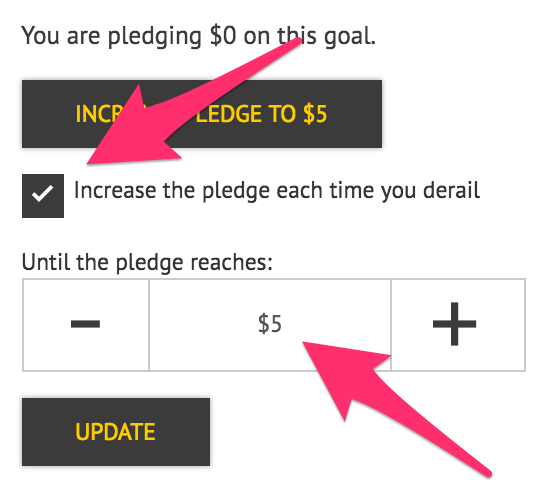 Click the pledge amount in the top line on the goal page to bring up the pledge settings. To set the pledge cap, first check the Increase the pledge each time... box, then pick the desired pledge cap using the +/- stepper buttons. Click Update to save changes. You cannot select a pledge cap lower than the goal's current pledge. If you want to do this, first step down the current pledge to that amount or lower, and then the desired pledge cap value will become available.